On Thursday of this week I had the pleasure of attending the third concert of a series, Music in the Afternoon, put on by the Women’s Musical Club of Toronto. I didn’t know what to expect. I only knew that the featured artist, Jens Lindemann, played the trumpet. It turned out to be my favourite concert to date. The concert started with a piano and trumpet duet. Jennifer Snow (who is also Jens’ wife) appeared on the stage and began to play. From the back of the auditorium the unmistakable sound of the trumpet joined in. Slowly Mr. Lindemann made his way to the stage while he played. Even though the concert started on a serious note, we quickly learned of Jens Lindemann’s fun side. Born in Germany, he introduced himself with a heavy German accent. He asked the audience if there were any other Germans amongst us and I quickly raised my hand. I had no idea that I would be the only other German born person to raise her hand and he immediately asked me, in German, where I was from. I told him Frankfurt and he told us that he came from an area close by. There were two other German speaking audience members but they were from Austria and he made a joke that with one German and two Austrians we had a party. I was nervous that he would ask me more questions in German but he moved on to talking about Tim Horton’s and all of a sudden his heavy German accent disappeared and he spoke in a natural ‘Canadian’ voice. The audience loved it. I should have known that he was putting us on because I had read that he came to Canada as a baby. He was raised in Edmonton and studied at McGill University and The Juilliard School. He’s won numerous awards as a celebrated soloist around the world and in 2014 he received The Order of Canada. For most of the show Lindemann was accompanied with a piano, bass and drums. Apparently it was the first time in the WMCT’s history that a drum set appeared on stage. The ensemble was made up of the celebrated and talented musicians of Kristian Alexandrov, Mike Downes and Ted Warren. We were treated to a range of musical styles from classical (Bach and Debussy) to Jazz (Duke Ellington), Tango (Piazzola) and contemporary composers (Sting, Alexandrov). The show ended softly just like it started but Lindemann featured his pianist, Kristian Alexandrov, with a number that he composed himself. Kristian’s Prayer brought tears to my eyes. At the end Jens joined in with a lovely rendition of What a Wonderful World. I bought Prayer from iTunes and I was able to find a video on YouTube of Kristian and Jens performing What a Wonderful World at McGill, four years ago. Enjoy! My lows include not posting for a number of days. I had over 500 emails that I hadn’t opened and I tried to read as many as possible. I deleted many of them without reading them so I apologize if I missed an important message or one of your better posts. If I made a comment or ‘liked’ your post you know that I read it. I actually do read your posts and I feel unusually guilty if I have to pass them over. I’m trying to read my emails daily but there are over a hundred in my inbox again. It’s been a tough week with the kids at school. I’m sure that it’s partly due to the time change. Everyone was tired and a bit cranky and with March Break in front of them many found it difficult to focus. There was a lot of excitement and anticipation for this holiday. I also haven’t done any art for myself. Every day this week I planned to spend some time on my art and it didn’t happen. I’m planning on fixing that during my time off. Now that March Break is here, I’ve come down with a head cold. Wouldn’t you know it! I’m not sick all year and on the first day of the break I have a scratchy throat and runny nose. Oh well, I have 9 days to rest. On the high side I managed to get more of the books in the library labelled and shelved and I finally put in an order for supplies and more books. I know that may not seem like a high for some of you but I always feel good when I can get something accomplished. Last Sunday I took my family to see Ray Cattell’s art show at the Arts and Letters Club. I’ve know Ray for over 25 years. His daughter, L and I work together and have been best friends for all those years. Ray is now in his 90s and it was nice to see the range of work that he has produced from the 1960s to the present day. 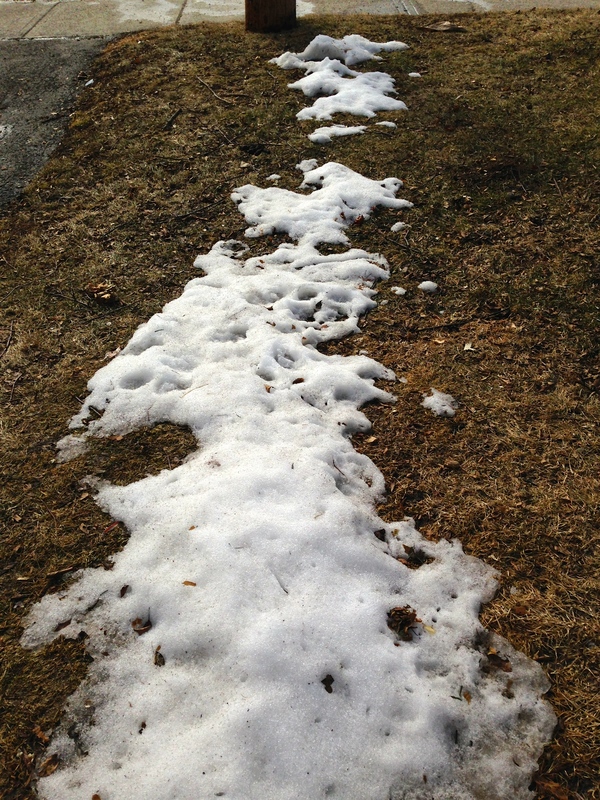 The temperatures have finally warmed up and the snow has started to melt. In fact so much of the snow has melted that I’ve finally been able to go outside without my winter boots on. A few crazy people have also been seen wearing shorts in Toronto. Plus 4 is hardly warm enough to go outside without a coat never mind wearing a t-shirt and shorts. I also went to a concert this week. It was part of the Music in the Afternoon concert series put on by the Women’s Musical Club of Toronto. The concert featured Jens Lindemann on trumpet. I had no idea what to expect but it ended up being one my most favourite concerts to date. I’ll write more about this in my next post. I also spent time with my friend CL who I hadn’t seen since Christmas. We had lunch together and then headed downtown for the concert. Afterwards we stopped for coffee and continued to catch up on what we’ve been doing for the last three months. As with most of my friends she asked about my retirement and gave me some food for thought as to what I might want to do when I finally take that step. On Wednesday a group of us from school decided to have a bit of a staff social and we went bowling and then out for dinner. Most of us are not very good bowlers but it was a lot of fun and we vowed that we would plan another outing after March Break. Last night my daughter and her husband came over for an impromptu dinner of homemade pizza and salad. My husband and I are very spontaneous and we love it when things like this just come together. 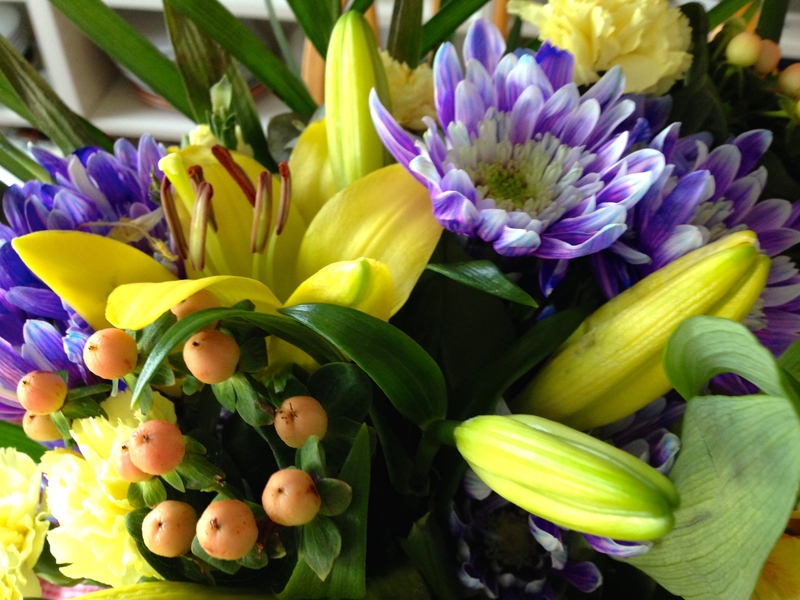 To top off my highs for the week my husband bought me another fresh bouquet of flowers.